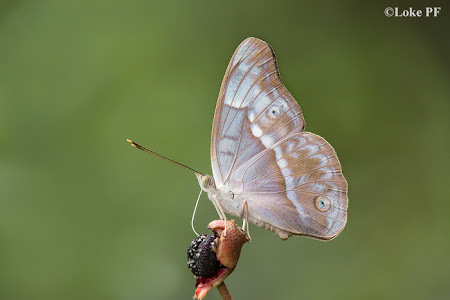 The relative abundance of its caterpillar host plant, Gironniera nervosa in the forested areas of Singapore, coupled with the habitats that it prefers, could be the reasons why the Purple Duke is a common butterfly in Singapore. This forest-dependent species is seldom found outside the nature reserves. The species exhibits sexual dimorphism where the male and female appear quite different from each other. Here is a shot of the female Purple Duke feeding on the ripened fruit of the Singapore Rhododendron (Melastoma malabathricum). Note the long bright green proboscis probing into the fruit to get the much-needed nutrients. This shot was taken by ButterflyCircle member Loke PF.